After a bit of a hiatus from my blog (reasons for which will become clear after Christmas) I’m back with a recipe I did a couple of weeks ago. 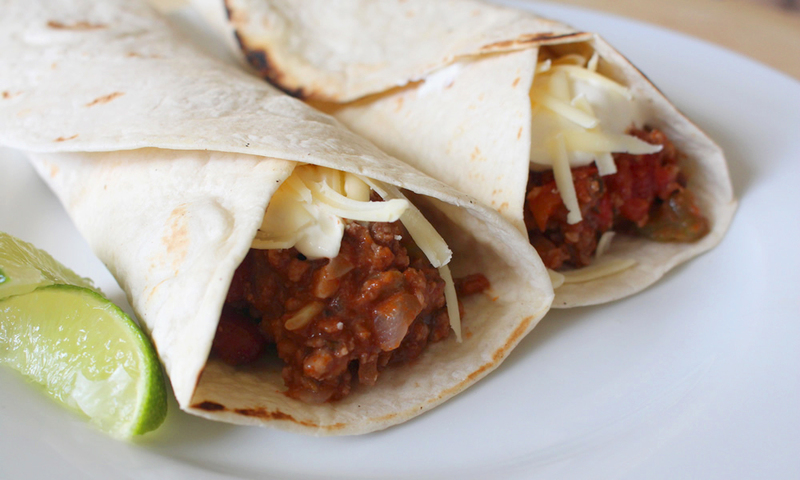 This burrito recipe is an attempt to try and make myself eat more vegetables, by “hiding” them in a tasty chilli, wrapping it up in a tortilla and covering it with cheese and sour cream, cunning eh? I’ve used a 50-50 split between meat and veg in this recipe and it’s best eaten the day after you make it. In fact please don’t eat it on the same day, you are missing out on letting all those flavours develop over night. First you want to weight the carrots and onion together and then add as many celery sticks to make up to 500g (same as the pork and beef, for me this was about 2 sticks). Chop the onions, carrots and celery finely (about 3-5mm cubes) and add to a large roasting/caserole pan with a little oil and fry for 5 minutes occasionally stirring until the onion starts to become translucent, then add the finely chopped garlic. Add the pork and beef mince to the pan and stir again. When the meat has browned add the chilli powder, cumin, coriander and chopped chilli giving it a good mix. Add the 2 tins of chopped tomatoes and let simmer for about an hour. After an hour give it a taste and season with salt and pepper. This is the time to add the beans and more chilli powder if you like it hotter and the worcester sauce if using. Let it simmer again for another hour, if it looks like it is getting very dry add some water but you do want the sauce quite thick. Cover and leave over night. The next day warm the chilli up. While it is reheating warm the tortillas in a pan and wrap in a clean tea towel to keep warm while you heat up the rest. Add a few spoonfuls of chilli to each tortilla (use a slotted spoon if the chilli is quite wet, there’s nothing worse than a soggy burrito). Top with sour cream and cheese, wrap and serve with lime wedges.